I love this little bonnet. There isn't a single thing I don't love about it. It was one of those classic little patterns that are fun and fast, the roughish cotton denim yarn was a neat new experience and if I do say so myself a stunning contrast with the Victorian looking feather and fan, and there should be no question that little Juniper is a girly girly girl in this getup. Also love-worthy: the ribbon is reversible grossgrain from Paper Zone. Let's just savor that for a moment: Reversible. Grossgrain. The specs are here in this post, because everyone should knit one of these. They are now part of my ideology. I hope some of you decide to make these. They're little gems. Thanks so much for posting that bonnet pattern. It's so beautiful! *k2tog (3 times), yo k1 (6 times), k2tog (3 times)*, repeat to last 4 sts. That would get your 6 decs to match your 6 yo's. But your solution is just as good, and a little more coherent. I know just the wee noggin I'm going to knit this for! Oh yay! I think the extra yarn from the "Kate" doll (knitty.com) I'm making now will be perfect for this hat. And someone downtown is selling hand-dyed silk ribbon. Not quite as cool as two-sided grossgrain, but it will work. Thank you! It's fabulous. I'll have to add it to my baby knitting repertoire. You are so right. Those colors are just perfectly rich and stunning. Gorgeous! I'm loving the mix of denim and dainty. I must track down a baby so that I will have an excuse to knit one. Hi, Denim maven here. They ought to wash it and dry in the dryer right away, to get the fade and the shrinkage over with, and so the dye won't rub off on lovely Juniper's head! Need I say that I love this hat and especially the whole idea of feather and fan, old-fashioned bonnet in DENIM? Good going! I love love love this bonnet. 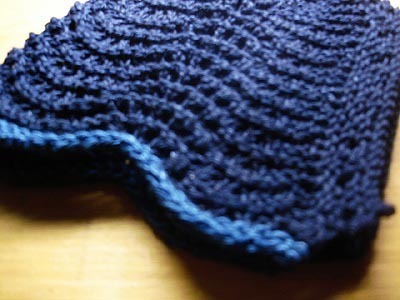 I bookmarked your bonnet ages ago when I first saw it on whip up. I finally had a reason to make one up, Here's how it turned out http://www.flickr.com/photos/tuttifruiti/170985723/ I used Rowan wool/cotton and a 3.75mm needle to downsize it for a newborn. 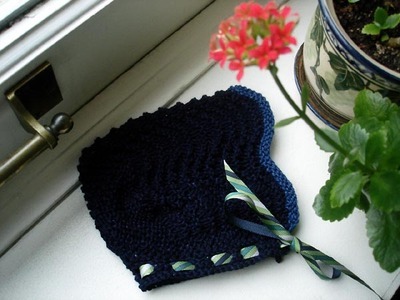 Wonderful blog and thank you for posting this pattern. You may call me obtuse but I've done the lace part of the bonnet, the crown, and I've seamed but not all the way down. For some reason, I can't understand "Then pick up all around (more stitches than the pattern says, because you left the back somewhat open)." Does this mean I'll pick up stitches around the entire bonnet? Will the back eventually, be sealed? What to do? Mayday! Mayday! Thanks in advance for any help you may provide. I look forward to reading your blog all the time now. How much do I love this bonnet? There are no words. Larissa, now that you've helped me figure it out, I'm going to do some for charity. This one is for my friend's daughter who'll be making her debut in about 4 months. "Then pick up all around (more stitches than the pattern says, because you left the back somewhat open)." Does this mean I'll pick up stitches around the entire bonnet? Will the back be entirely closed then? Any insight will be gretly appreciated by me. This is so beautiful. I have a question though, since this is knit in denim is there problems with it shrinking wierd? Does it need to be washed before gifting it to get to the correct size? I have a new niece coming and can't wait to make this for her. Your color choices are striking and beautiful! Hi and thanks for this cute little bonnet- I have mine almost done - however I have a question about the decrease rows. am I reading the pattern correctly ..
K 8 K2tog to end this takes me to K8 K2tog at the very end of the row. When I did this I had one side slanting and one side not. Help what am I doing wrong. It came out wonderful - I should have jut trusted my fingers :-) Thank you for this wonderful little bonnet. With luck, this process is already under way.